EZ Facebook Retargeting - How To Setup Your Facebook Retargeting Campaigns With Ease! Discover How To Professionally Use Facebook Retargeting Campaigns To bring Back That 98% And Convert 'Window Shoppers' Into Buyers! This video series will show you how to properly set up and use the power of retargeting on the Facebook platform! Statistics show that, in general, only 2% of prospects convert. The other 98% leave and may never come back to your site. This means that any money you've invested to get people to visit has been lost. That can quickly add up to a lot of wasted money! "Why Do Visitors Leave Without Paying Or Taking Any Action?" Facebook Retargeting marketing is gaining more and more popularity with website owners. In fact, I'm sure you've run into retargeting ads targeted towards yourself! Imagine you go to Google.com and type in a specific item that you're looking to buy, say BBQ grills. Let's say this BBQ grill website owner sets up a Facebook retargeting campaign. You're interested but you don't buy at that very moment. Maybe you're busy and you leave. Then you go to Facebook and see ads related to the site you just visited. You're intrigued and come back and buy! That's a huge amount of people that, otherwise, would likely never have come back! The best news about this? This Step-By-Step Video Series Shows You How To Create Your Own Highly Successful Facebook Retargeting Campaign! Are you excited about using retargeting marketing for your business? In this video, you will be given a quick overview of the course. We'll talk about the basic concepts and what you need to get started the right way. Whenever you set up any retargeting campaign, it can get extremely tedious if you don't know how all the pieces of the puzzle fit together. To ensure you succeed, you'll get to see how everything connects to each other - so you know exactly what you need to learn ahead of time. Before we jump in and show you how to create a highly-targeted campaign, we need to show you some real-life examples based on what you learned in the previous video. Different scenarios require different campaign setups and are never created equal. We'll cover basic setups such as blog posts, email list building, purchase / sale, and filling out a form. Once you understand the Facebook Pixel, it's time to add it to your website. Where do you add it? What if you use a WordPress site? What WordPress Plugins are recommended? All that and many more will be shown in this video. Once you've added the pixel to your website, it's time to fully understand different ways to using it. In specifics, we'll cover different pixel settings you can use to track initial visits all the way to actual conversions. Now it's time to understand how Custom Audiences work. In short - they allow you to target the right audience based on the action that they have taken, but we'll discuss this in more depth here. In this video, we’ll cover how to create custom audiences in a step by step manner. If you can follow our mouse, you'll have no problem doing this. We'll also discuss each setting and its importance and our recommendations. Congratulations! At this point, you have reached the end of the video series. It's time to create your general Retargeting campaign so you can be on your way to getting back lost visitors. 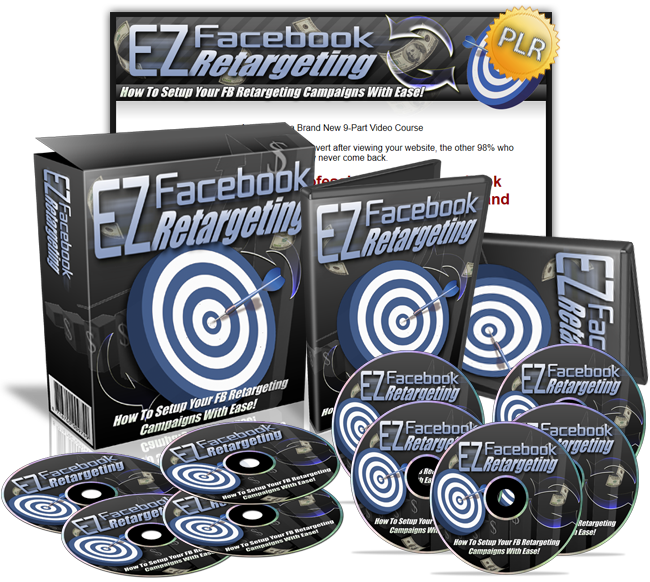 Grab This PLR Video Series Now And Learn How To Create Your Own Highly Successful Facebook Retargeting Campaign! So you can turn 'window shoppers' into buyers by recapturing those 98% of visitors who left your site, and finally get more sales and see the success you've always wanted to achieve! P.P.S. Have you tried other facebook retargeting tutorials and had no success? Unless you take drastic action right now, nothing is ever going to change. Don't wait any longer!